On Thursday, April 4, the Living Wage Campaign (LWC) held a panel in the Lowry Pit for the campus community to learn about the different aspects of the living wage and to engage in a dialogue with members of the College’s faculty, administration and students. The panel was moderated by Gabe Melmed ’21 and included President Sarah Bolton, Vice President for Business & Finance Charles Ingram, Vice President for Advancement Wayne Webster, Chair and Associate Professor of Economics Amyaz Moledina, Professor of Sociology Tom Tierney and former President of the Student Government Association (SGA) Monét Davis ’19. The President was followed by Davis, who asked the audience to raise their hand if they attended a LWC event or have written a letter to the administration or Board of Trustees. Moledina analyzed the living wage from an economic standpoint. He said that there is both “empirical and theoretical research” that shows that at the firm level, paying above the equilibrium shows unique working effects; workers start investing in their health, make responsible choices, productivity increases and turnover decreases. The College sets the wage in this area because it is a “monopsony,” (antonym of monopoly) so if it is not paying sufficient wages, there would be high labor turnover, which Moledina said there is currently evidence present. 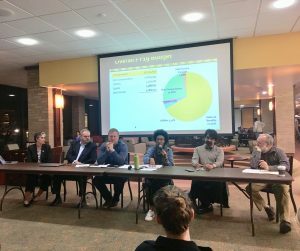 After the panel turned into a question and answer format, Ingram broke down the compensation allocation: faculty account for approximately $15 million of the salary/benefit budget, salaried staff for $13 million, hourly staff for $10.1 million and student workers for $1.7 million. Bolton addressed the added struggle of appropriately accounting for raises that staff have received for working at the College for a long time. The living wage would be the lowest guaranteed wage, but adjustments would have to be made for those who currently make above the current $11.00 per hour to avoid decompression. After Bolton stated that she wishes the College could pay a living wage, Marco Roccato ’20 asked if there were any concrete plans. Webster explained that while many alumni give donations to the College, they are already earmarked for projects that were important to that individual during their time or scholarships that will allow students to come to Wooster. When a student raised a question about creating an endowment for the staff, Ingram said that one could be created with a minimum of $50,000, which the Voice understands was communicated to the LWC by the Vice President for Advancement, Wayne Webster, last semester. Bolton and Ingram both said that raising the lowest wage is a priority for next year because this past year they focused on a new system where those that make the highest wage pay more for healthcare in order to subsidize healthcare for those that make the lowest wage. According to Ingram, there will be a shift differential put in place to make it easier on workers who have shifts late at night, which should help with staff retention. Robyn Newcomb ’20, co-president of LWC, is currently studying abroad but watched a recorded video of the discussion. Davis was also pleased with the event and told students the importance of holding both the administration and student governments accountable. “I would like to encourage everyone to get involved and to put pressure on people who are in [organizations] like SGA and Campus Council,” Davis concluded.